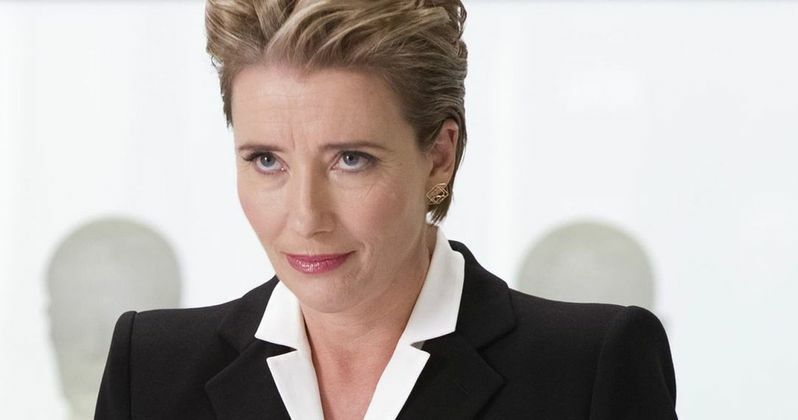 Emma Thompson has boarded the cast of the upcoming Men in Black 4 spin-off. The two-time Oscar-winning actress will reprise her role as Agent O, which she previously played in 2012's Men in Black 3. Emma Thompson joins a mostly new cast that is headlined by Chris Hemsworth and Tessa Thompson, who reunite as the new agents we'll track on this adventure following their team-up in 2017's Thor: Ragnarok. This is a particularly important bit of casting when it comes to this Men in Black spin-off. Though Sony has been pretty clear that this isn't an outright reboot, without the presence of Will Smith or Tommy Lee Jones, it was difficult to know for sure if this new movie was going to have any actual ties to the previous three movies. Indeed, having Emma Thompson back as Agent O will provide the glue that connects Men in Black 4 to its predecessors. This also opens the door for Smith or Jones to possibly return at a later date, assuming this reboot does well enough to warrant another sequel. The cast for the reboot also includes Kumail Nanjiani, who stars in HBO's Silicon Valley and starred in last year's critically-acclaimed comedy The Big Sick, which he co-wrote alongside his wife Emily V Gordon. Nanjiani is said to be playing an alien sidekick, but that's about all that has been revealed so far. Liam Neeson, who became an unlikely action star with Taken a decade ago, is also among the franchise newcomers, with Jurassic World: Fallen Kingdom star Rafe Spall also on board in an as-of-yet undisclosed role. Chris Hemsworth previously was glimpsed in photos from the set as filming got underway in London. F. Gary Gray is in the director's chair for the spin-off, who most recently directed The Fate of the Furious, which grossed more than $1 billion in 2017. Gray also previously helmed movies like The Italian Job and Straight Outta Compton. All three of the previous Men in Black movies were directed by Barry Sonnenfeld. The script for the spin-off comes from Matt Holloway and Art Marcum, who previously penned Iron Man for Marvel Studios. So, they do have a previously established track-record of starting off very profitable franchise ventures. Emma Thompson had a great year in 2017, having starred in Disney's live-action Beauty and the Beast, which was the top-grossing movie of the year worldwide. She also appeared in The Meyerowitz Stories on Netflix, which received a great deal of critical acclaim. She's currently in production on Robert Downey Jr.'s The Voyage of Doctor Dolittle and can be seen in Johnny English Strikes Again later this year. The Men in Black spin-off is set to arrive in theaters on June 14, 2019. We'll be sure to keep you up to date as more details on the project are made available. This news comes to us courtesy of The Hollywood Reporter.